Almost as important as the decision of which ship to mine in is what you should mine. Much of the time people mine and then refine their ore into minerals and either sell the minerals or use them in industry, but some people choose to just sell ore as without good refining skills much of the value of the ore is lost in refining waste. 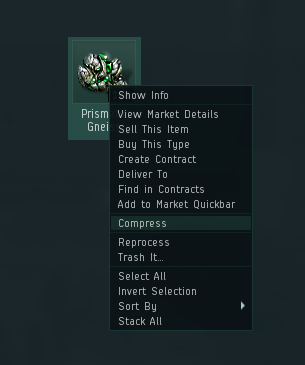 When mining to sell ore, your profit is calculated in isk/m³. This is because mining modules calculate yield in m³ per cycle instead of units per cycle. and different ores have different volumes per unit. As an example, Veldspar has a very small volume per unit (0.1m³), when compared to Spodumain (16m³ per unit), so, you can fit many more units of Veldspar in your hold than Spodumain, and mine far more units per hour of Veldspar. 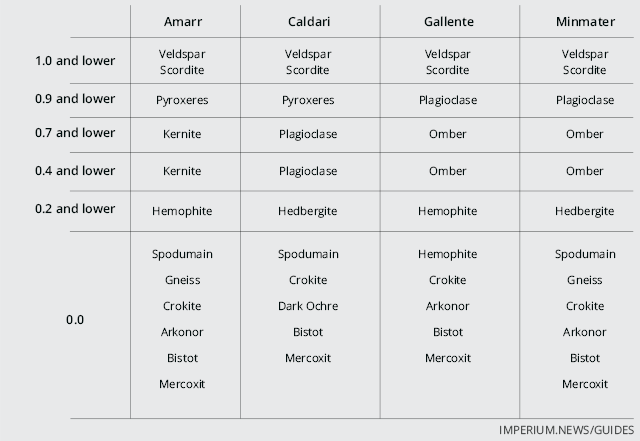 However, Spodumain contains more minerals per m³, and has more valuable minerals in it, so when you refine 100 units (the minimum number you can refine at one time), you not only get far more minerals than you get from 100 units of Veldspar, but they are worth much more. 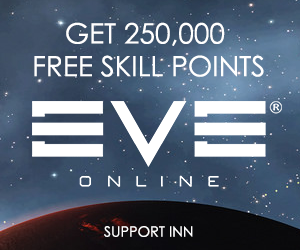 One tool people can use to determine what ore to mine for profit are websites like Eve Market Data which lists both the isk/m³ for refined minerals and ore as well as isk/hour. This site updates prices daily so should always be reasonably up-to-date. 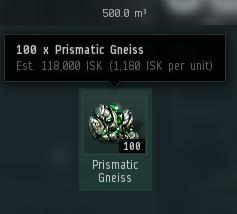 Where you mine matters a great deal when trying to make the most isk/m³. Nullsec ores are worth more than lowsec ores which are worth more than highsec ores. There are also safety trade-offs between mining in high security space and null security space. In nullsec, alliances are able to upgrade the space they own so that anomalies can spawn. These anomalies contain far greater amounts of ore than a regular belt, as well as the nullsec specific ores of Spodumain, Dark Ochre, Gneiss, Crokite, Bistot, Arkonor, and Mercoxit.These are generally considered the pinnacle of mining profitability. Further information about mining and sov can be found under the Advanced Mining section. Mercoxit is considered by some people to be the most profitable ore to mine in the game because it is worth the most isk/m³. However, this is a misleading statement at best and horribly wrong at worst. Mercoxit can only be mined using Modulated Deep Core Miners or Modulated Deep Core Strip Miners and these mining modules have a lower m³/cycle than other mining modules. 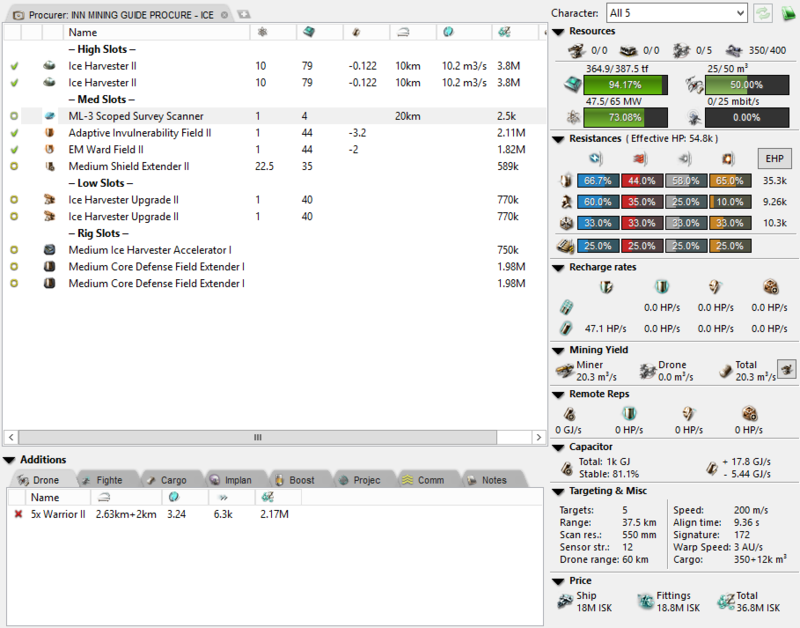 If you mine Mercoxit with max skills for mining it the isk/hour can be comparable to mining null ore, but the mining skills just for Mercoxit mining are a separate train than other mining skills and most people do not max them out. A note about Modulated Deep Core Strip Miner II’s – you do not need to use a mining crystal in order to use these, a crystal increases mining yield but is not necessary in order to mine Mercoxit. In addition to requiring additional skills and different modules to mine, Mercoxit also produces a damaging gas cloud that does damage to anything within 5k of it. The chances of producing a damage cloud is reduced with each level of Deep Core Mining that is trained. This is actually not generally a problem – all you have to do to avoid this is sit over 5k away from the Mercoxit rock as well as watching for damage to any drones. However, Mercoxit mining has to be done in order to cycle nullsec mining anomalies. 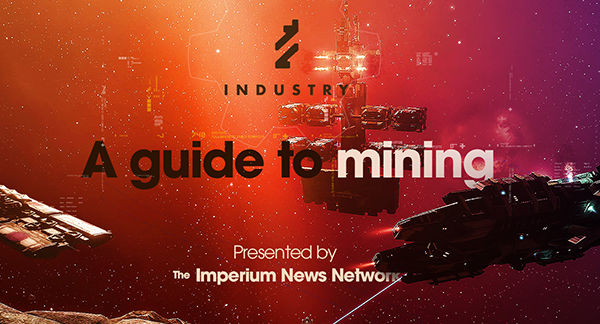 A nullsec mining anomaly that is associated with sov and industry activity defense multipliers (ADM) will respawn in a 5min period once the last asteroid is mined out, and thus there is an infinite supply of ore available for mining – as long as you mine ALL of the rocks. In highsec and lowsec, the ores you find in asteroid belts are determined by what racial space you are in. An important point to note when mining to sell ore is ore compression. Compressed ore generally sells better than non-compressed ore because it is easier to move. Compression reduces the size and number of units of ore. In the above example, 100 units of Prismatic Gneiss has a volume of 500m³ and an estimated value of 118,000 ISK. 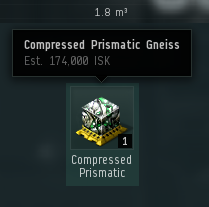 100 units of Prismatic Gneiss compress into one unit of Compressed Prismatic Gneiss which has a volume of 1.8m³ and an estimated value of 174,000 ISK. The reduced volume allows greater amounts of ore to be stored in an ore hold as well as easier transportation of ore.
One thing the observant reader may have noticed from the above section is the use of Prismatic Gneiss in the examples instead of Gneiss. Prismatic Gneiss is a type of ore variant. Gneiss is the base ore, Iridescent Gneiss yields 5% more minerals when refined. Prismatic Gneiss yields 10% more minerals when refined, thus the +5% and +10% ores are more valuable than the base ore types. In highsec, ore variants spawn in belts along with the base ores but in lesser quantities. While you will find the +5% and +10% ore variants in a 1.0 security status system, the quantities that spawn in belts increase as move down in security status. In nullsec, you find the nullsec ore variants in mining anomalies depending on anomaly size and security status of the system.The ore variants you find are based on the truesec of a system as well as the industry index. 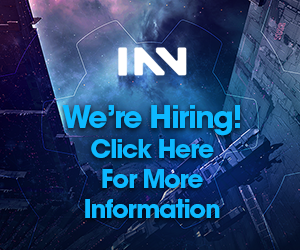 The +5% and +10% ore variants require an ADM Industry Index of 3 or greater as well as the first, second, and third mining upgrades installed in the Industrial Hub for the Large Asteroid Cluster anomalies to spawn. (This goes for level 4 and 5 for the upgrades and index to get Enormous and Colossal anomalies to spawn as well) (More information about ADM and sov mechanics can be found in the Advanced Mining section. In the Large, Enormous, and Colossal asteroid cluster anomalies in true sec systems of -.46 through -.85 will spawn with +5% ores and in true sec of -.86 through -1.0 will spawn with 10% ores. Rocks not to your liking? Prefer huffing space gases instead of chewing rocks? You’re in luck because you can do this instead and it’s still considered mining! There’s actually two forms of gas mining, and they have two very different end products. Gas mining in highsec, lowsec, and nullsec produces the basic components for creating combat boosters, while gas mining in wormhole space produces the basic components for making Hybrid Polymers, which are then used in the production of Tech 3 destroyers and cruisers. Since these two forms of gas harvesting are so different, this guide will cover them separately after noting the similarities between them. Gas mining can be performed in any ship with at least one turret slot, but the kings of gas harvesting are the Venture and its Tech 2 derivatives, the Prospect and Endurance. Gas mining cannot be performed by a ship that has high slots but no turret hardpoints, as the Gas Harvester modules require a turret hardpoint. Gas mining also requires a certain amount of scanning, as all gas clouds are found inside cosmic signatures rather than in anomalies. There are also two different types of gas, Mykoserocin and Cytoserocin. Mykoserocin clouds are found in high and low security space, while Cytoserocin clouds are found in low and null security space. The Mykoserocin and Cytoserocin “flavors” are each used to produce a different sort of booster. The Mykoserocin are used for the synth (weaker and with no drawbacks) version of the booster while the Cytoserocin flavors are used to produce the stronger varieties of the booster (the stronger varieties give you a bonus to one attribute but also the chance of attribute penalties based on which booster is being used.) Cytoserocin clouds are also unstable and deal damage when harvested – this damage is usually around 1,000 thermal damage, though some of them may also do small amounts of a secondary damage type. The writers of this guide recommend taking care when gas huffing a new type of Cytoserocin cloud for the first time. The gas found in wormhole space, as noted, is used for the production of Tech 3 destroyers and cruisers. These sites have some mechanical differences from those found in K-space. Firstly, the gas clouds do not deal damage to those harvesting the gas. Instead, Sleeper drones will spawn 15-20 minutes after the site is first warped to, and then attempt to destroy any player ships on grid (unless they are cloaked, or are a Zephyr shuttle). While the exact details of each site are outside the scope of this guide, you can find more information on that in Rykki’s Wormhole PVE guide. Gas sites spawn in all classes of wormhole, except for two: The Instrumental and Vital Core Reservoirs, which only spawn in C5 and C6 space. Scan down and bookmark the gas site in your cloaky scanning ship. Warp to the site at 100 KM in the cloaked scanning ship, and bookmark the gas clouds. Note the time at which warp to the site was initiated (the description pop-up appeared), and set a timer for fifteen minutes. In the harvesting ship, wait for the bookmarks to propagate and warp to one of the two clouds. Establish a 1km orbit on the gas cloud, lock, and begin huffing! Once the timer expires, begin to align out. As soon as the Sleepers arrive on grid, leave. If you’re day tripping, you’re probably done with that site. Move onto the next. If you live in the system, or are directly next door in w-space, you can clear it and harvest the rest of the gas. A perfectly skilled Venture with 2 Tech 2 Gas Harvesters, receiving no boosts, will harvest 80m³ of gas per 30-second cycle. With fifteen minutes of harvesting, this results in 2,400m³ of gas. In short, you’ll need between 2 and 27 Ventures to completely clear a wormhole gas site before the Sleepers spawn. Of course, if you add a perfectly skilled Porpoise that runs two T2 Mining Foreman Boosts with Mining Laser Optimization Charges, you can reduce those numbers to needing 19 Ventures at most. Of course, if you’re ninja huffing in a C5 with 19 Ventures and a Porpoise, all with perfect skills, why aren’t you just Rorqual mining in nullsec? The goal is to huff the gas and get out, after all. You can replace the cloak with a probe launcher to do single man ninja huffing. Fitting a Prospect for this is much the same, save for changing the cloak to a Covert Ops Cloak and adding another 2 Warp Core Stabilizers. Whichever ship you use, you’re not going to tank much anyway, so focus on simply getting out of trouble if it arrives. Ice mining is similar to ore mining in that you equip mining lasers or strip miners called Ice Harvesters to your mining ship and shoot at rocks; however, it is different in many other aspects. All skills and mods that improve ice harvesting decrease cycle time. This is because ice is always mined one block at a time. It is important to note that because ice is mined one block at a time (and in whole blocks only) if you turn off your lasers before the cycle ends, you get nothing. Each block of ice is 1000 m³. Whereas ore mining skills and mods both decrease cycle time and increase yield, ice is always a cycle decrease. Being so massive, one can only mine a handful of ice blocks at a time before having to consider what to do with the ice. The same mining methods that apply to ore also apply to ice. Ice spawns in green anomalies in all sec systems as well as shattered wormholes. One finds these anomalies by accessing the probe scanner menu; however, you do not require a probe scanner to scan them down. In high sec and lowsec you find different varieties of ice depending on what region you are mining in. Space in Eve can be divided into four spheres of influence corresponding to the four sections of empire. There are also other varieties of ice found in all areas of space with the appropriate sec status. Glare Crust is found in .3 and lower systems, Dark Glitter is found in 0.1 and lower, and Gelidus and Krystallos are found in 0.0 and lower systems. 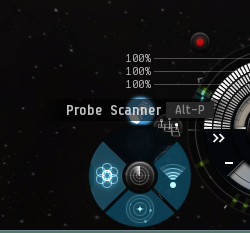 The regular racial ice is found in highsec and lowsec systems, while the +10% variant ice is found in nullsec and all varieties of ice are found in shattered wormholes. When mining ice, one uses ice mining lasers or Ice Harvesters (the strip miner equivalent) instead of mining lasers or strip miners. One also uses Ice Harvester Upgrades instead of Mining Laser Upgrades. One benefit ice mining has that ore mining does not is a rig for mining barges and exhumers – the Medium Ice Harvester Accelerator reduces the cycle time of ice harvesters by 12% which is a noticeable bonus. Because of the size of one unit of ice (1,000 m³) compressing ice is even more important than compressing ore.